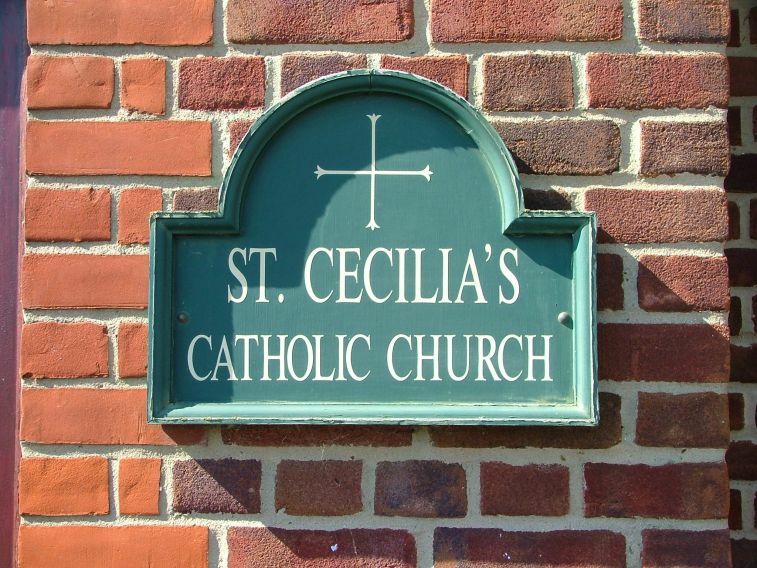 This Catholic church is the story of what one woman's patience can endure, and what her resolution can achieve. 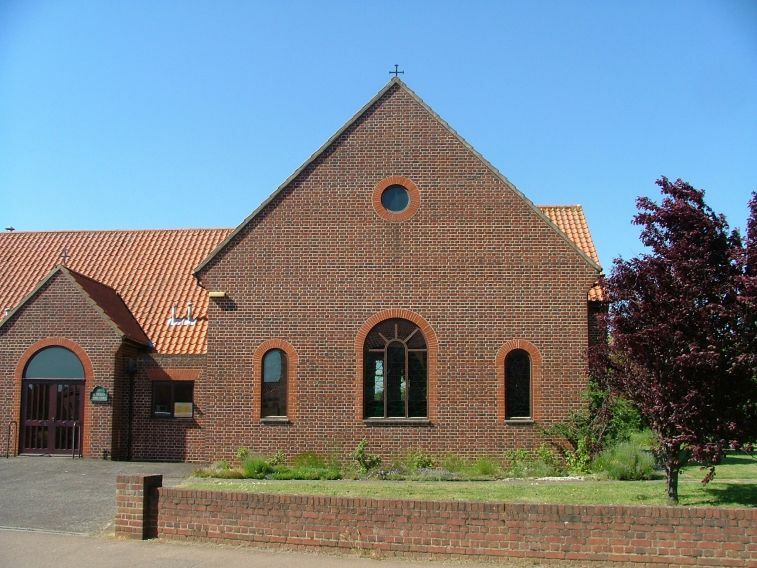 It sits on a modern housing estate, but actually only yards from Dersingham's high street, a handsome red brick building with ecclesiological features but otherwise solidly in a Norfolk rural vernacular. Dersingham is part of the suburban sprawl to the north of the Sandringham estate, now happily bypassed. It runs into Ingoldisthorpe and then Snettisham, but all three have characters of their own, and Dersingham is the most town-like. Sandringham itself merges into the village, and as you leave the Anglican parish church of St Nicholas on its rise to the east, you are soon among the rhododendron-lined lanes of the estate. 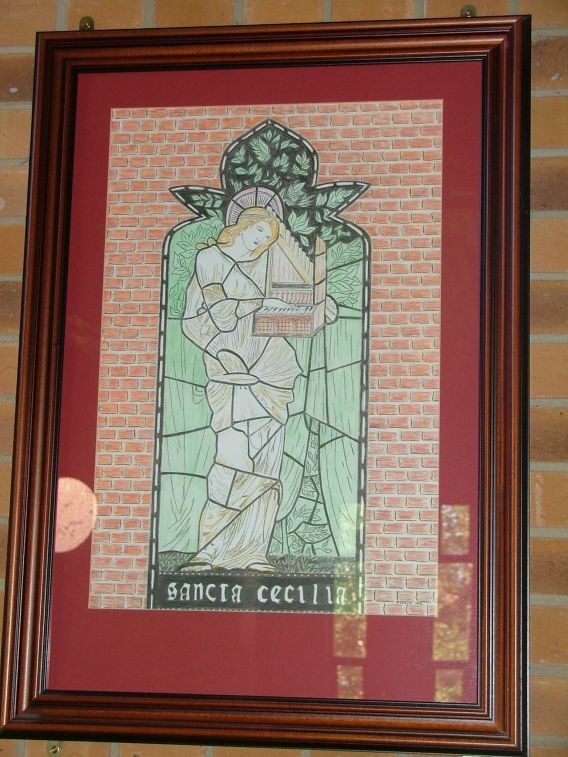 St Cecilia is the more central of the two main churches, and with its modern facilities it is regularly in use by local secular community groups. Not long after we arrived to take our photographs, we were lucky that Deacon Len turned up. He lives in the house beside the church, and was happy to show us around. The eastern part of the building forms the actual church, a rectangle sat end-on to the road. The sanctuary is set within the eastern wall, a traditional position but actually within the longest wall here, and so creating, in effect, a church in the half-round. 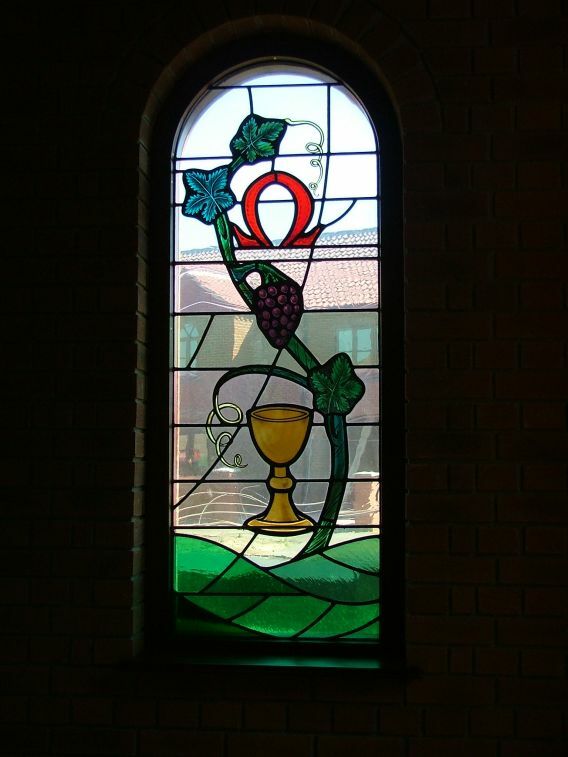 There are lancet windows at the northern end, and arched windows filled with coloured glass at the southern end. Tracking in the ceiling allows the sanctuary to be screened off when the room is used for secular purposes, although Deacon Len tells us that the statue of Our Lady is never removed. 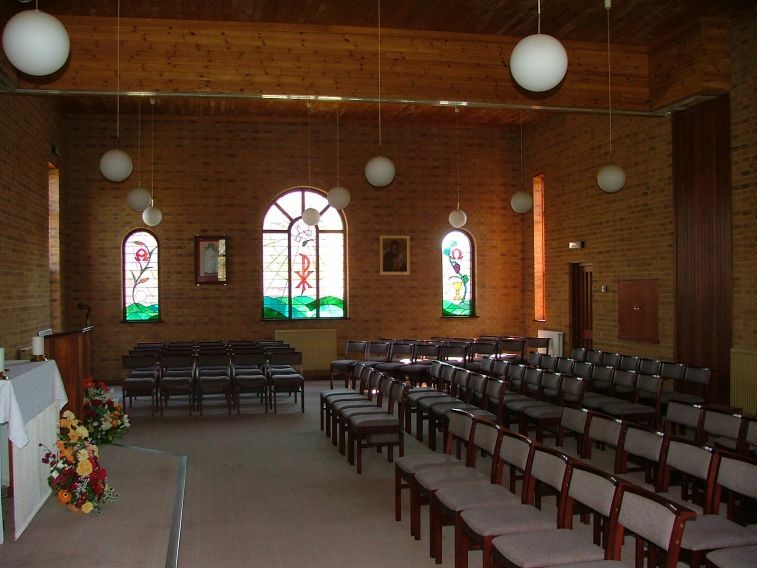 There is also a track enabling the entire room to be split into two, so that one side can be used by groups while Mass is in progress, although Deacon Len says that, in practice, this doesn't happen; too much noise leaks through the partition. To the west are offices, kitchens, toilets and meeting rooms. At the other end of the complex is the Deacon's house, like a presbytery. Although the building is traditional in style, it contains all the modern facilities you can think of. Of course, the medieval St Nicholas up on the hill was a Catholic church before the Reformation, but after the long penal years it was not until 1992 that the Catholic Church returned to having this permanent home in Dersingham. From the middle of the 19th century Dersingham was in the vast Kings Lynn parish, and then from the 20th century in the new parish of Hunstanton. 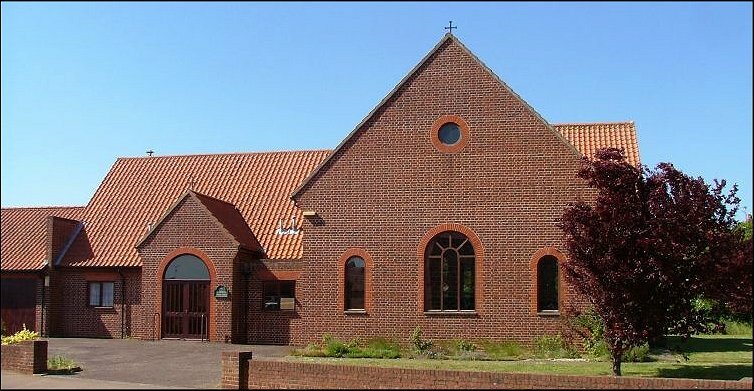 There was no local Mass centre, and Hunstanton is is some nine miles away, and it so happened that a local Catholic woman who cycled to Mass every Sunday decided that other Dersingham residents should not suffer the same inconvenience as herself. Deacon Len told us the heart-warming story. It seems that when the lady in question retired, she decided to keep herself busy by playing the stock market. By the time she died, she had amassed an impressive £300,000. 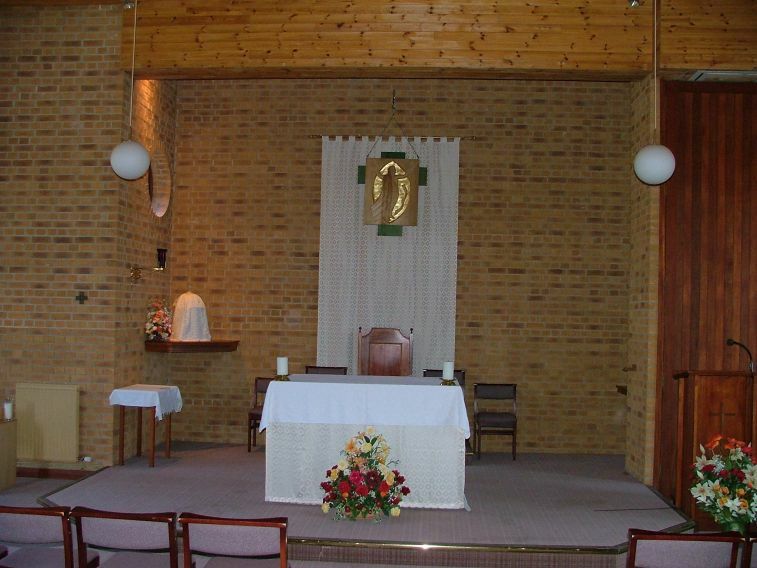 In her will, this was left to the Diocese of East Anglia, but on the singular condition that it must be used within ten years to build a Catholic church in Dersingham. If this did not happen, the money would revert to the estate and be split ten ways for different charities. 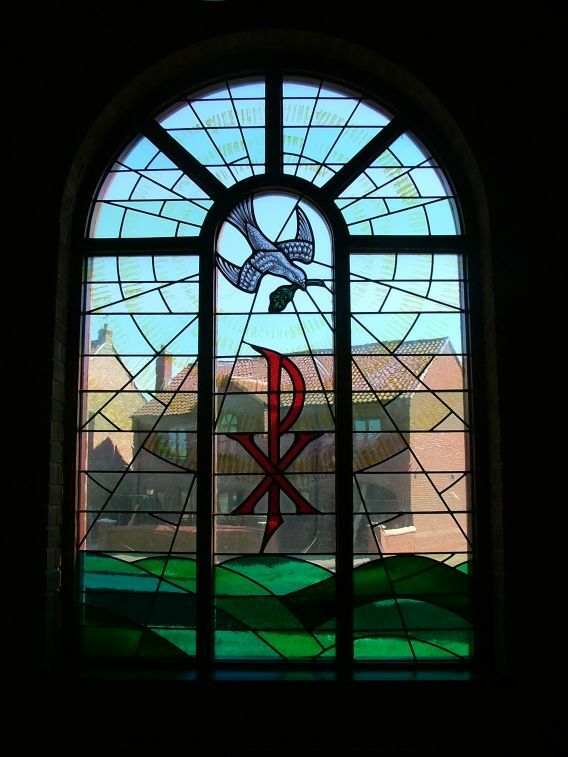 The Diocese accepted the money and its conditions, and then took nearly ten years to decide to build the church. 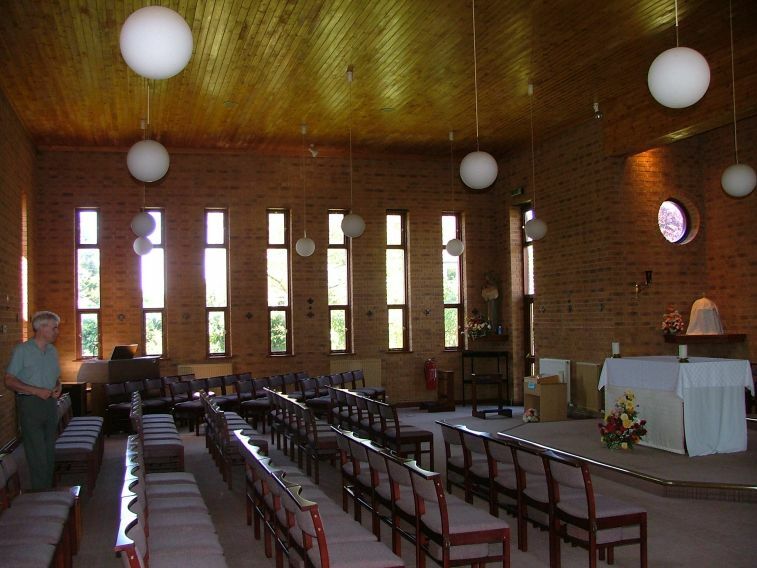 In that time, the money had gained interest, and so it was that almost £400,000 was available to build what is actually just a chapel of ease, but a finer building than some parish churches in the Diocese. Perhaps one day, it might even achieve that status. It would certainly be ready for it.